The survey was anonymous — no identifying information was requested. 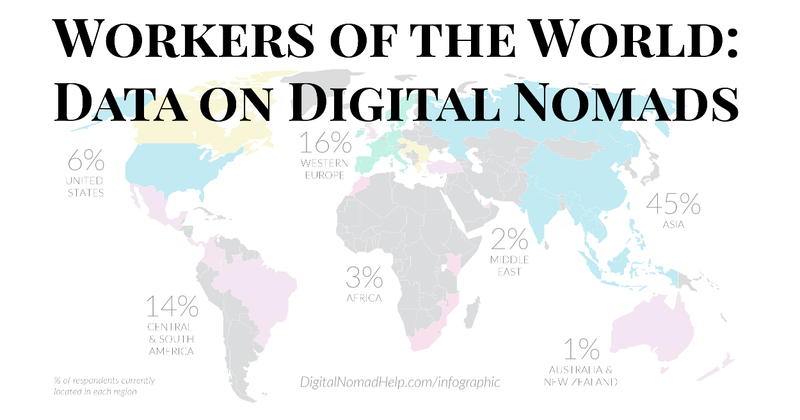 To get responses, we shared it in digital nomad Facebook groups and with our Remote Year community. 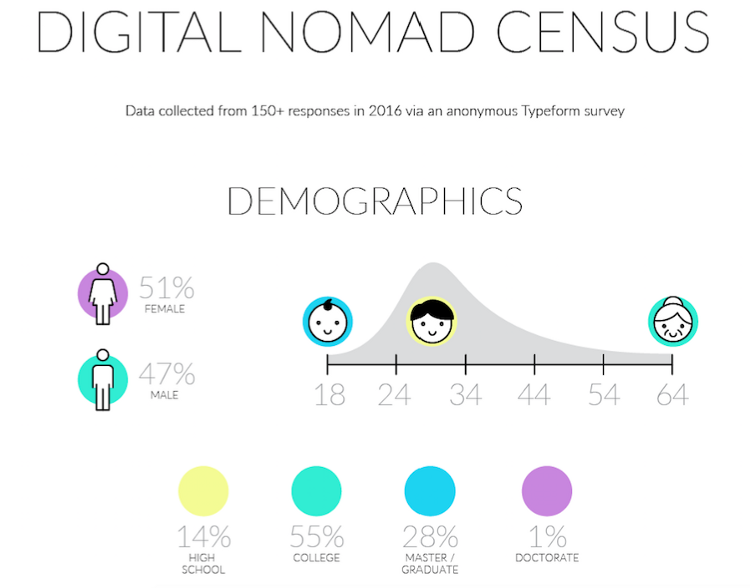 We received over 150 responses, so though it wasn’t a comprehensive census of the entire digital nomad community, it does provide insights to who it is comprised of & answers some common questions people ask about the lifestyle. 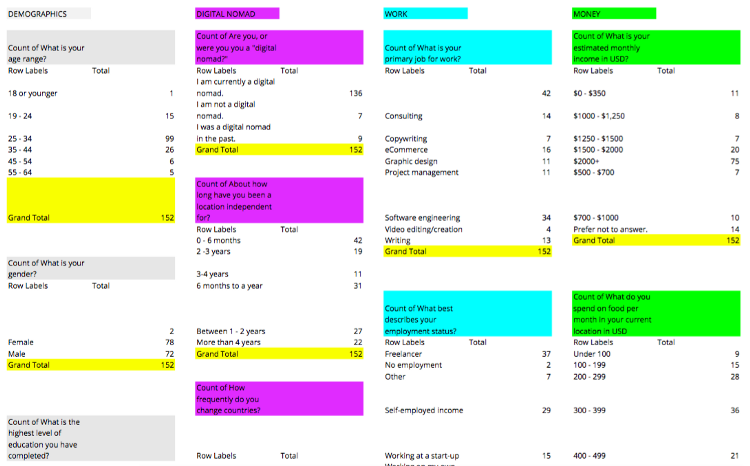 I took the raw data and used filters & pivot tables to summarize the answers to each question. Much of the data had to be sorted & summarized individually because people wrote in answers, like specific $ amounts, which were unsortable until I rewrote each one as a readable value (lesson learned). Then I had to start making design decisions and figuring out the best way to represent the data. This was my first infographic, so I was also learning new ways of using Adobe Illustrator. I decided to use a designer’s friend icons, vector map, and typography hierarchy from a project we collaborated on as a starting point (Laura Hansenis credited on the infographic & I asked for her approval, of course). I changed the color palette to a series of bright Pantone colors generated from a swatch I liked, and I made the fonts Lato and Playfair Display to match our website and other materials. My summary data and the initial design elements. Thanks to Google and YouTube, I learned how to use the graph feature in Illustrator, creating bar graphs and pie charts from my summarized data. Once I had all the data represented visually, I went back to the section in the book where we discussed it & pulled in some of our insights, rewriting them for the infographic. As I got the graphs & text laid out, I continued to bring in more color and alternate between white and colored backgrounds to define the sections & make the visuals pop. After a few check-ins with Peter and a final review by Laura, the infographic was finished! Peter created a new blank page for me on our website, I uploaded the final file and wrote out some descriptions, added social share and links to other resources on the site, and voila.